This review first appeared in the February 2014 issue of San Diego Troubadour. Tord Gustavsen is one of those hyper-productive types the rest of us can’t help but envy. Or resent. The lovely music found on his latest release, "Extended Circle," will turn even the harshest resentment back to pure green envy, though. "Extended Circle" is more akin to early 1980s new age/world beat than what would come to mind for most of us on hearing the term “jazz piano.” The majority of the compositions here are performed in a seriously down tempo, introspective mood, more Windham Hill than Blue Note. But unlike much of the pabulum that exemplifies what new age has devolved into over the past 30 years, Gustavsen’s compositions are powerful, melodic, structured. They remind more of vintage new age and world beat, back when those kinds of music were still about pushing beyond jazz while maintaining the improvisational impetus at jazz’ heart, when vision was as important as virtuosity. 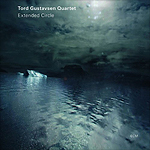 Gustavsen’s music exemplifies this attitude (which, to be honest, has been honed to near-perfection on the ECM label that is home to Gustavsen, and whose founder, Manfred Eicher, produced "Extended Circle"), creating a sort of chamber jazz that is as serious and artful as classical, but with the accessibility of jazz. Saxophonist Tore Brunborg is the perfect foil for Gustavsen’s piano playing, as well as a wonderful interpreter of Gustavsen’s songwriting. Beautiful in tone, with a thick growl in the lower registers of his tenor horn, Brunborg’s playing complements Gustavsen’s piano  weaving harmony and melodic lead, back and forth with Gustavsen. Bassist Mats Eilertsen and drummer Jarle Vespestad provide a limber, supple backdrop for Gustavsen and Brunborg, but often end up the lead voices for extended passages as well. It is a remarkable recording, one filled with joyous exploration  one defined by its sound of surprise, as the late jazz critic Whitney Balliett so aptly captured the feeling of listening to great improvisational music.